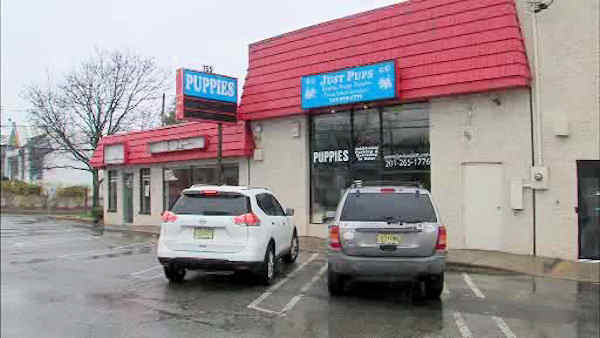 PARAMUS, New Jersey (WABC) -- Just Pups in Paramus was closed by the Paramus Health Department on Monday after 50 puppies and small dogs were found crammed in a van behind the store. Authorities say two Paramus police officers were conducting checks in the rear area of local businesses around 3 a.m. Monday, a routine part of their patrol duties, when the officers observed a white 2002 Freightliner Sprinter van parked outside of the regular parking stalls behind Just Pups, located at 155 Route 17 southbound. According to police, the officers heard crying and whining as they approached the van. Police say they immediately smelled a strong scent of feces and urine coming from the van and, as they looked inside, they spotted several small dogs. The officers entered the van through an unlocked sliding side door, where they located numerous small metal crates, each containing between two and four puppies. Police say the crates were too small for some of the dogs, leaving them unable to stand. Some crates didn't contain food or water, and some held dogs that were covered in feces. The temperature inside the van was 38 degrees Fahrenheit, only three degrees warmer than the outside temperature. Police say there was a propane tank connected to a space heater in the rear of the van, but that space heater was ineffective in providing heat. Police also say the van did not have proper ventilation. A computer check revealed the van belonged to a person who is the listed owned of Just Pets. The Bergen County Prosecutor's Office Animal Cruelty Task Force and Tyco Animal Control were called to the scene. The responding police officers determined that the animals needed medical evaluations, and the puppies were transported to Oradell Animal Hospital in Paramus. While at the hospital, it was determined that 15 puppies needed further medical treatment. The incident is being investigated by the Bergen County Prosecutor's Office Animal Cruelty Task Force, Paramus Police detectives and the Paramus Health Department. The store will remain closed pending the current investigation.